Cellular plastics consist of thin polymeric membranes separating small cavities or cells. The cells may be mostly closed and separate, mostly open and interconnecting, or a combination of the two. The percentage of open cells is indicative of the insulating quality of cellular plastics and is an important variable, requiring control during manufacture and evaluation after production. The ASTM Standard Test Method D2856 provides a procedure for determining the percentage of open cells using an older model of an air comparison pycnometer. This device is no longer manufactured. 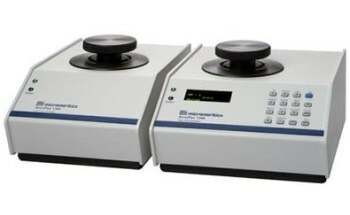 However, you can determine the percentage of open cells conveniently and with greater precision by performing a test which uses Micromeritics’ AccuPyc Pycnometer. The test, conducted as described in this application note, is comparable in all respects with the ASTM standard method. As in the standard method, you cut a sample from the original material and determine the volume of the sample. This cut opens some of the closed cells. You then make a second cut of equal area on the same sample material and determine the volume again. The second cut allows you to compute a correction for the cells opened by the first cut. While the ASTM D2856 standard specifies air as the operating gas, dry nitrogen is satisfactory in all aspects. Dry air may be used if desired. Table 1 lists suggested parameters to minimize the effect of cell membrane permeation by the analysis gas. Table 1. Analysis (and purging) parameters. 1. Slice two 1-in. (2.5 cm) cubes from the sample. Use a sharp cutting device such as a razor blade and a ruler to make sure the cubes are cut to precise dimensions. 2. Accurately determine the geometric volume of both sample cubes (Vg). Vg is a crucial number in computing the open cell volume. 3. Place both cubes in the sample container of the AccuPyc and determine the gas displacement volume (Vp1). The sample container holds 100 cm3. The two cubes occupy about 30% of the container, providing enough volume for precise measurements with the AccuPyc. Note that Vp1 is less than volume Vg. This is because open cells are excluded from the AccuPyc measurement. Some of these open cells were created while cutting the sample to size. 4. Cut both cubes three times with a razor blade along lines parallel to the sides of the cubes (refer to the figure below). Trisecting both cubes creates a total of sixteen smaller cubes and doubles the exposed surface and the number of cells opened by cutting. 5. Place all sixteen sample cubes in the sample container of the AccuPyc again and determine the volume (Vp2).